Here's one of the superb new game from NetEnt. 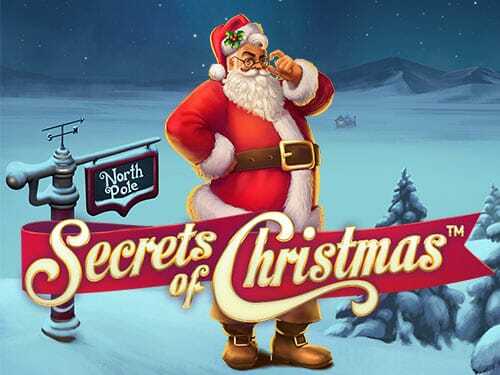 Secrets of Christmas is one of new online slots games that you will want to run home and tell the family about, especially at Christmas time, although it can be played at any time of year if you do so desire. These 5 reels over 3 row slot boasts 25 pay-lines all of which will bring about all that Christmas cheer that you’ve been looking for. If one activates the free spins feature, then the player will in-turn create new avenues for players to boost their cash prizes. Like with most slots there is a lot of personal interpretation required to connect the dots. Free spins and bonus multipliers will all push those numerical values past the point of no return (something that is great for you!). Secrets of Christmas has many secrets (who’d have thought), and secrets were made to be broken. It seems like NetEnt have gone out of their way to create an environment where players must open their presents early, the presents of course being cash prizes and things of the like. You will go through a constant state of euphoria here, after all, who didn’t wish they could have peeked inside the wrapping paper to see what lies beneath. Some even have stories of doing so in real life although Secrets of Christmas seems to have a certain style about it. NetEnt have once again gone above and beyond to create a recent slot games experience here that stands the test of time and season by the look of it. Everything from colour scheme to gameplay is well executed with players finding that ever-elusive Christmas spirit. We highly recommend playing a Christmas themed playlist in the background of this title just, so you can feel all warm inside (unless you’re a Grinch/Scrooge, which if that’s the case then you might wanna skip this one). If you love promo's, get the best UK casino bonuses. In 1996 Net Entertainment was formed in Sweden as an offline casino operator, today NetEnt is one of the leading names in online gaming that now stretches worldwide. The ever-growing list of games that NetEnt have created have, if anything, inspired many other games within the market, this is something that is completely unheard of in modern day gaming, where re-inventing the wheel can be difficult when there is already a set path of creating a successful slot. Since its inception NetEnt have produced over a hundred titles, each with their own significant themes and experiences. These guys are tried and tested and have even stood the test of time itself, over a decade of entertainment and we’re sure there will be decades more to come. NetEnt: the dynasty of the online gaming industry. Christmas themed online slots seem to be all the range throughout the online gaming stratosphere. There are many reasons for this with the main catalyst being the joy Christmas brings to a lot of people around the world. Well now that joy can continue in the form of NE tents Secrets of Christmas 5x3 reel online slot! It’s the gift that keeps on giving, but we're sure you'll see that for yourself sooner rather than later. Whether you have been good or bad this year, it doesn't matter, in this game you are rewarded through smart decisions across the reels to receive your very cozy cash prize presents that nestle safely under the tree. NetEnt’s Secrets of Christmas features a very simple layout. 25 fixed pay-lines mean that it’s a game of strategy and looking out for key combinations on the fly. An auto play mode is also a worthwhile feature, allowing you to run games off in the background should you be busy with other activities in real life or simply just wish to take a break. Secrets of Christmas can be played on both mobile and desktop devices, allowing you to take the spirit of mass with you wherever you may go. 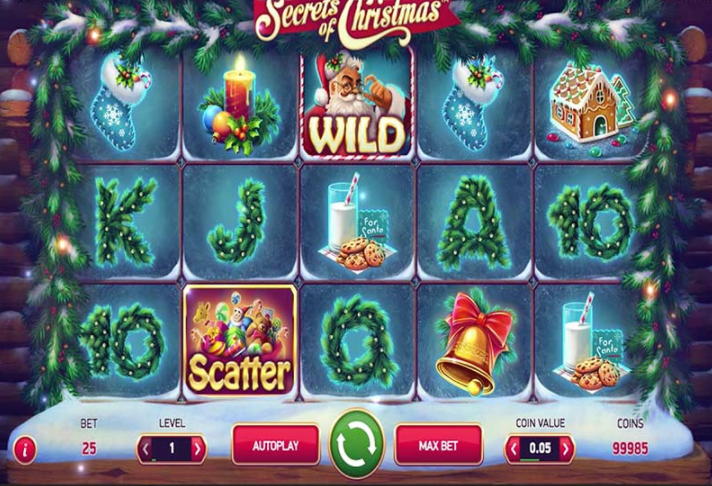 Both offer a different type of experience depending on what you are really into when it comes to online slot games, but even so, Secrets of Christmas ticks many boxes that a lot of fans have for this type of slot. The design of this game is set in a very winter wonderland, a wooden cabin in the snow plays as the backdrop to this game with the reels being framed by wreathes of holly, a nice touch for a game that is meant to cause an influx of jolly emotions. What NetEnt have managed to achieve visually is enough of a reason for you to try this title alone. Secrets of Christmas has but one feature: a free games feature that allows the player to reach even higher up the Christmas tree to gain a much higher score. These free games are activated through the matching of scatter symbols in winning pay-lines. There is a lot of these to go around so keep sharp and you'll find your path to the free games. This game is nothing short of a Christmas miracle, there is so much to see and do no matter the season. NetEnt have managed to craft such an experience that it transcends just another mass game. If you enjoy a slot that tugs on the heart strings then play Secrets of Christmas, trust us it is well worth your time. There is no doubt in our mind that you will be decking the halls of bows of holly falalalalalala with this slot. Most Christmas themed titles seem to focus in on a theme, most of the time to their own detriment. An idea may be considered then not fully capitalised on due to a lack of overall self- awareness that plays a very key part in many games in the market. Secrets of Christmas knows exactly what it is and its purpose, this allows it to break new ground and extend its reach to maybe the players out there who haven't tried an xmas themed online slot before. 9/10. If you enjoyed Secrets of Christmas then you might also like Draculas Family.